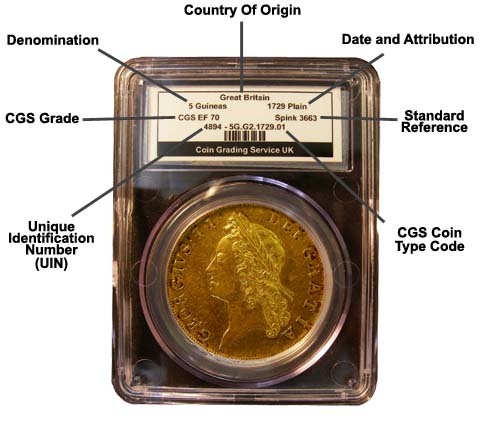 All coins that have been encapsulated by CGS LTD have a serial number what they call a UIN (unique identification number) attached. When keyed into a My Page function available to members of the CGS web site a range of useful facilities become available including an automatic valuation module with produces a statement giving the current valuation of the collection logged. The CGS my page allows collectors to effectively manage their collections by one simple input of the UIN number. Once your collection is logged in the range of menu options shown become available. This will show an image of both sides of each coin in your collection. Shows the best know collections by monarch and denomination. This is where your collection is initially input (by UIN number) and where sold or disposed of items may be deleted. Shows the current list price of your collection.